Dep from Gorakhpur to Kathmandu night stay in the hotel. In the morning by 6.30 am, breakfast in the hotel and then continue for the sightseeing tour in Kathmandu by 8.00 am. You will visit Pashupatinath Temple and Budhanilkanth Temple, both are biggest holy temples of Nepal in regards to Lord Shiva & Vishnu respectively. Return to your hotel after temple visit and take lunch in hotel. Time free for personal activities and other pre Kailash Manasarovar yatra preparation. If the briefing was not done last evening due to some reasons, today evening we will have short briefing program followed by introduction to all group members. Dinner and overnight stay at hotel. Optional Tour : One can even book for Mountain flight as an optional tour for this morning. This is an hour flight over world’s highest mountain peaks. The flight departure time is at 6.30 am therefore those passengers who booked for this incredible flight should be ready by 5.30 am in the hotel and one of our Kailash tour officer will pick them up from hotel lobby and transfer to the airport to board the mountain flight. Remarks : If need be, depending on rush of pilgrims and keeping in mind long queues at immigration counters in the morning time our tour guide may decide to take the group to Kodari this evening for night stay. This will facilitate the yatris to avoid long waiting in the queues at the border. Today early morning wake up and drive to Kodari border. On the way we will make short break for tea/coffee with packed breakfast. On reaching border. Upon arrival at Kodari border we will start immigration formalities and meanwhile yatris will also take lunch in a decent restaurant (veg meal only). Our border representative will assist you to clear immigration & customs in Nepal side. Then get ready to cross the border in Tibet region. You have to walk for 5-10 minutes to reach the ‘Nepal-China Friendship Bridge’ and stay in queue as per serial number mentioned in your passport. It may take longer time and our local officer or office will have no control over the immigration formalities. So you need to stay patient and calm till you receive your turn here. . We clear Chinese immigration and custom formalities with the help of our Tibetan guide. And then after, we get in to our vehicle in Tibet side for our onward journey to Nyalam. After 30 minutes drive the group will reach the nearest town of in Zhangmu where you have to wait again to clear immigration formalities by our guide & driver. From Zhangmu it takes another an hour or more to reach Nyalam. On arrival, check into guesthouse and take rest for today. Our kitchen crew will serve hot tea/coffee with light snacks within short interval of time after setting their kitchen. Then you can stroll around hotel vicinity or go walk for shopping in nearby market. Dinner will be prepare by our cook and serve between 7 to 8 pm (Chinese time). Important note : Being you are staying in high elevation at 3750m, there might be consequence of uneasy feeling with your health during the first night, so it is suggested to all travelers to drink liquid more as possible that may be in any form of soup, juice, tea, coffee or hot water. This will help you in re-hydration as well as in breathing system. This day is reserve for rest day for the acclimatization with Tibet’s climate. Our tour manager will assist taking you to short hike in and around Nyalam county for warming up your body to adjust with Tibet climate. Also, we enjoy the day with chanting Bhajan or Katha in our guesthouse. Today our journey begins to reach our ultimate destination of Mt. Kailash. Wake up by 7.00 am, take breakfast by 7.30 am then begin the tour to the next destination of Saga / Dongba. This routine will be normally followed all day during your further trip ahead. After short drive of 10 km, you can see Milarepa Cave situated in 400m downhill side from the highway. Then we across the first highest pass Thong-La (5200 m) enroute, from where you can enjoy the magnificent view of one of the highest peak in Tibet called Mt. Shishpangma (8013 m) along with Mt. Choyu and Mt. Dorje Lakpa. After high pass, we leave ‘Friendship Highway’ that goes to Lhasa and change the direction to the West which is leading to towards Mt. Kailash and Lake Manasarovar. We halt for half an hour on the way in check-post where our Tibetan guide and driver will clear permit formalities and then continue drive ahead with another break at near Peiku Tso for lunch. Our drive continue again along through some distance with great view of Lake Peiku Tso and reach Saga, a small developed town situated at the bank of River Brahmaputra (Yarlung Tsangpo). Finally, we arrive Dongba / New Dongba for our overnight stay after some couple of hours drive. This place is used to be the regional trading centre in the past. Being the road is all fine our journey will be smooth with picturesque view of snow capped mountains and passing through some villages & camps of yak herders (nomad camp). Dinner and stay in the guesthouse. 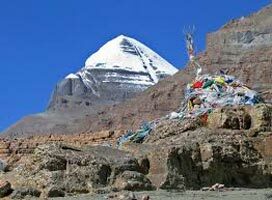 We have very important day today as we are heading to the holiest place at Lake Manasarovar. As per above time schedule, our day begins with breakfast at 07.30 AM and leave for another point. On the way before Mayumla Pass (4900 m), we take break for permit formalities and for lunch then continue the journey crossing Mayumla pass and Paryang. You will have very good opportunity to see first glimpse of Mt. Kailash from the shore of Lake Manasarovar. There will be few minutes halt before heading to our camp / guesthouse at Lake Manasarovar for the permit formalities. This time you can use for praying Mt. Kailash. After immigration complete, we will drive further to our camp near Chiu Gompa and will stay in the guesthouse. Today, you will complete Lake Manasarovar parikrama approx. 70% and rest will be complete when you return from Kailash Trek. You will have very significant moment in Lake Manasarovar with almighty bless and even graceful evening with the breathtaking view of holiest Lake Manasarovar and Mt. Kailash. Besides this, you can also see or visit Chiu Gompa Monastery situated in hillock near Guesthouse. Today morning, we wake up comfortably and we will find a good place for holy dip in Lake Manasarovar for all our pilgrims. Depending on possibilities we will also arrange shower tent nearby the bank of Lake Manasarovar for changing clothes especially for ladies and also you can arrange your puja / havan (prayers) at feasible place according to you. Our crew member will assist you if anything help require. After finishing holy bath and puja, and taking lunch, we make short drive to Darchen. On the way to Darchen, we can also see panoramic scenery of Rakshas Tal (Demon’s Lake) in the other side of Lake Mansarovar. Darchen is the major administrative hub of Kailash region with very basic development in infrastructure and facility and also considered as the base camp of Mt. Kailash from where the circumambulation around Kailash begins. You can stroll around small market in Darchen in the afternoon. Dinner and stay will be in a guesthouse. Optional trip to Asthapad from Darchen on request can be arranged but please be informed that one should trek from Darchen - Asthapad - Darchen, there is no transport service available as Chinese Government has made restriction for transport in this area. Today, we wake up early and take breakfast then head to Tarboche / Sersong. All pilgrims have opportunity to pass through Yama Dwar before trek commence. Also, the members who are not going for parikrama will return from Yama Dwar after very close darshan of Mt. Kailash from this point and get back to Darchen waiting for parikrama group. And other travelers who are going for parikrama will continue trekking ahead by foot or horse. Yatris who select to hire horse/yak will be given name coupon to choose the horse & porter if any travelers book for this and the same horse or porter will accompany throughout the trip. And we will manage Yaks & Yak men to carry our camping logistics for kora/parikrama. Night stay at a guesthouse/camp at Dhirapukh. Today trek is flat and gradual ascend along through the bank of Glacier River so it will be easy and reach Diraphuk camp comfortably within 5 hours. We will stop in mid way for our lunch. Our Tibetan guide will help us to book our guesthouse in advance and will check into room immediately as soon you reach there. Diraphuk is one of the best and closest points from where we can see crystal clear north face of Mt. Kailash standing ahead. You will have great opportunity to take several memorable picture of Mt. Kailash from here. The night temperature will be too cold below zero degree so we will have quick dinner and rest in bed. Wake up very early morning before dawn, take quick light breakfast and get ready to begin your parikrama towards next destination Zuthulphuk. 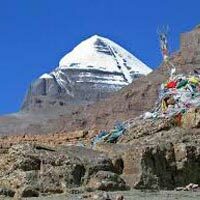 This day is considered as toughest day of Kailash Manasarovar Yatra. The trek goes steep climb up continuously upto Dolma La high pass (5600 m) for about 4 hours and steep down to Gauri Kunda and upto flat valley for about 2.5 hours then after you will walk all the way flat land for about another 2/3 hours. That’s why, it is the tough & longest trek of about 8/9 hours. We should cross the high pass as early as possible in pleasant weather before strong windy at day time. At the top of Dolma La, you can even find the place called Shivasthal that is covered with holy flags and the personal related things like clothing, ornaments. There is strong belief in Tibetan religion that whatever you offer here you will get it in heaven after your death. Travelers should not forget to carry their packed lunch from kitchen before start trekking. After crossing Dolma La pass, you will see Gauri Kunda at downhill in the right side of your path. Then further walking down for a while, we will take break for lunch. This downhill trail is not easy due to rocky & loose stones so we should walk very carefully. Then after, you will catch soon flat trail that reach to Zuthulphuk. Also please note, the travelers who are in horse ride should also walk for 2 to 3 hours in between trekking while you are coming steep down after Dolma La. In Zuthulphuk, we will have guesthouse or fixed tent with bed, bed sheet & warm blanket. Similar as in Diraphuk, we will take dinner at earliest it prepared and go to warm bed. This is our last trek day and we have to make short trek about 2.5 hours so we wake up in normal time and begin trekking to descend Darchen town. Our transport will pick up us from the mid way (Chongdo) to take us to Darchen, upto where the road is accessible and drive to guesthouse at Darchen where our other groups staying and then take lunch there. Then after, we continue our drive to Dongba by completing the remaining course (approx. 30%) of parikrama of Lake Manasarovar. Stay and food will be at the guesthouse. Today is our last day in Tibetan Plateau. We will return to Nyalam town, the last night near border town of Nepal. We will chant and enjoy all the team together in the last evening with wonderful memory. Also, we will keep gratitude program to all staff team members from Nepal and Tibet side for their hard work & devotion to make your trip safe and successful. After 10 days long trip and enjoyable trip in high isolated land of Kailash Manasarovar we feel more safe and comfortable today once we drive to the border in early morning. Our eyes feel relief to see all lavish greenery surrounding and easy breathing once we across Nepal. As previous way, we will clear immigration and custom formalities in both Tibet & Nepal side and take lunch near the border then move to Kathmandu. Drive from Kodari to Kathmandu can take longer due to bad road condition near the border area. Upon arrival at Kathmandu we check in hotel at and after long while have good time to take warm shower to refresh. Have delicious taste of food in dinner and spend comfortable night in your hotel. After breakfast you will be transferred to the Tribhuvan International Airport to board your flight back to home or your further journey to Muktinath Temple (if booked additionally).